Since the process of DNA-directed protein synthesis was discovered, scientists and philosophers have searched, more or less seriously, for a relationship between the triplet nucleic acid codons and the chemical nature of the amino acids. These attempts have been uniformly unsuccessful, but remain an occasional topic of speculation because of their possible insights into the origins of life. There does not appear to be a specific interaction between the codons and the amino acids themselves. Instead, the match is made by transfer RNA, the Rosetta Stone that translates the nucleotide language of codons into the amino acid language of proteins. This translation is physical and direct: at one end of each tRNA is an anticodon that recognizes the genetic code, and at the other end is the appropriate amino acid for that code. Errors in the production of proteins can occur at both ends of the tRNA. The proper amino acid must be added to the tip of tRNA, ready to be added to a growing protein chain. A battery of enzymes, termed amino-acyl tRNA synthases, are in charge of this job. They generally make a mistake in about one out of every ten thousand tRNA molecules that they charge with an amino acid. We'll look more carefully at these fascinating proteins in the next Molecule of the Month. Errors may also occur at the other end of the tRNA, when the anticodon matches up with a codon. It may simply match improperly--this happens about one time in five hundred. Or, because each codon is three nucleotides long, it may associate in a shifted position, instead of the proper reading frame. This will throw off the rest of the protein, as each successive tRNA lines up in the wrong position after the shifted one. Fortunately, when genetic sequences are read in the wrong frame, they are filled with STOP codons, so the protein synthesis will be aborted after a few dozen more amino acids are added. Biological evolution is remarkable in its ability to benefit from shortcomings. If there is any way that a problem can be made into an asset, the process of natural selection will find it eventually. Errors in protein synthesis are no exception. Both the mismatch of codon with anticodon and the shifting of reading frames play special functional roles in certain organisms. In many places, different codons are used as START signals. The codons may be GUG, UUG, or AUU, but all use the same methionine tRNA, which normally recognizes the codon AUG. In order for these proteins to be made, the methionine tRNA must pair with these erroneous codons. Shifting of the reading frame is essential in the lifecycle of HIV. When making the long polyprotein, which contains all of the proteins that are found inside the virus, ribosomes make a mistake in one place about 5% of the time, aligning a tRNA incorrectly and shifting the reading frame. This causes the ribosome to miss the normal STOP codon, so a much longer protein is made. These occasional errors are critical for the life of the virus, because the longer proteins contain the enzymes that transcribe the viral genome. Phenyalanine and aspartate tRNA. The attached amino acids are shown with arrows and the anticodons are shown at the bottom. Transfer RNA molecules are composed of one short chain of RNA, 70-90 nucleotides in length, folded into a trefoil shape. Two different molecules are shown here, phenylalanine tRNA (PDB entry 4tna ) and aspartate tRNA (PDB entry 2tra ). The two ends of the RNA chain are close to one another at the pointed end of the L-shaped structure, at the top in this illustration. The amino acid is added here, at the position shown by the arrows. The center of the chain forms the rounded leg of the L, shown here at the bottom, exposing the three nucleotides that form the anticodon. The other two loops of the trefoil are bundled into the elbow, where they provide structure to the whole molecule. The four normal RNA bases-adenine, uracil, guanine and cytosine-- obviously do not provide enough latitude to form a sturdy structure, because many of the bases are modified to enhance their structures. To see two particularly exotic examples, look at the base next to the anticodon, number 37, in the initiator methionine tRNA (PDB entry 1yfg ) or the phenylalanine tRNA (PDB entries 4tna and 6tna ). 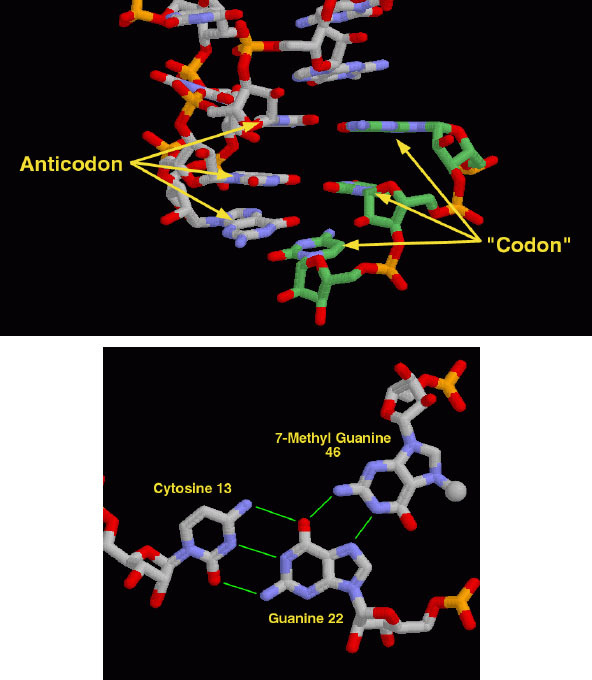 Of course, the first thing we want to look at when examining a tRNA structure is the anticodon. The structure 2tra , an aspartate tRNA, forms a dimer in the crystal lattice, with the anticodons of two separate molecules bound together. This is shown in the upper figure. The segment from the second molecule (with carbon in green in the illustration) will give you an idea of how the codon of an RNA message would bind to the tRNA anticodon. The anticodon in this structure is composed of guanine 34, uracil 35, and cytosine 36. The lower figure shows the interaction of three bases in the structure 4tna , a phenylalanine tRNA. The cytosine and guanine form a typical base pair, just as in DNA, but a second guanine, modified with a methyl group (white sphere), forms an unusual interaction with the pair. These illustrations were created with RasMol. You can create similar pictures by clicking on the PDB accession codes, and then choosing one of the options for 3D viewing. John G. Arnez and Dino Moras (1999) Transfer RNA. In "Oxford Handbook of Nucleic Acid Structure" (Stephen Neidle, Editor) Oxford University Press. Pages 603-651. Alexander Rich and Sung Hou Kim (1978) The Three-dimensional Structure of Transfer RNA. Scientific American 238 (No. 1), 52-62. Jack Parker (1989) Errors and Alternatives in Reading the Universal Genetic Code. Microbiological Reviews 53, 273-298.